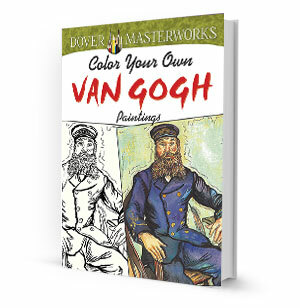 Express your creativity with 30 meticulously rendered black-and-white drawings of van Gogh masterpieces. Bring alive skillful adaptations of Sunflowers, Starry Night, Self-Portrait with Bandaged Ear and Pipe, The Church at Auvers and many more. The original paintings are included in full color on the inside covers for reference. The illustrations are printed on only one side of perforated pages, making it easy for artists to remove and display their finished pieces.